On The Menu: Submission Au Gratin & Surrender A La Mode. 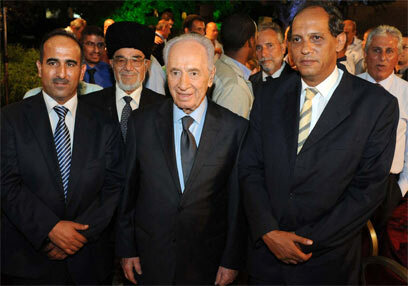 Israel’s President Shimon Peres hosts Ramadan dinner for Egypt’s Deputy Ambassador Mustafa Al-Kuni. Yeah…… I know this isn’t th…… STOP YELLING ! At the end of the festive meal, which also took place amid rocket fire from Gaza on southern Israel, Peres addressed the diplomat, Mustafa al-Kuni, saying he hoped Egypt would “be liberated and know economic prosperity”. Al-Kuni refused an offer to speak. The president also expressed hope for a ceasefire with Gaza’s terror groups. “I don’t see any reason for anyone to want a war,” Peres told leaders of the Arab sector, foreign diplomats, Knesset members, and regional council heads in attendance. Gleeberfreepin hoobenswanda mickorplabbah bobbendorfer !!!!! Okay, that’s better. Sorry ’bout that. I just noticed that range ammo is gettin’ expensive these days. What ?…… Where’d you think I went ?…… That’s how I calm down. President Peres, a sidebar if you will, Sir. Thank you for taking the time to meet with me in private and thank you for your decades of service to Israel. WHAT THE HELL IS WRONG WITH YOU ?!? Have you lost what little is left of your mind ?!? “If we’re nice to them, they’ll be nice to us” doesn’t cut it with anyone who’s even remotely aware of who and what these people are (Islam 101). Do you have even the slightest clue that the peace lovers are toying with you and have been forever (Taqiyya) ? Listen up and listen good, Sparky: If these genocidal maniacs wanted actual peace, it would have happened centuries ago. It’s in their own book to kill every Jew on the planet and convert, rule over, or kill every other non-believer or ‘infidel’ (Qur’an Commentary). And as for the rest of Kadima and Labour, y’all seriously need to tell them to STFD and STFU…… Sir. It’s come time for warriors to save The Homeland and our people. Y’all can start back in again stomping your little feet about “social justice” after the tires get kicked, fires are lit and the dust settles. This entry was posted on Monday, August 22nd, 2011 at 05:42 and is filed under Main Postings. You can follow any responses to this entry through the RSS 2.0 feed. You can leave a response, or trackback from your own site.